Making home prepared food for your pet can be both healthy and fun! Home prepared food is likely to provide your pet with fresh ingredients and high moisture content ingredients; both of which provide valuable nutritients for your furry friend. 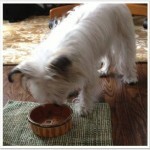 For today’s recipe, I’ve simply combined some of my favorite pet food and pet supplements and put my own twist on it. Because I am using commercial pet food as my base, I know I have a complete and balanced meal. Mix Vital Essentials Beef Sprinkles and warm water in pet bowl to a soup consistency. 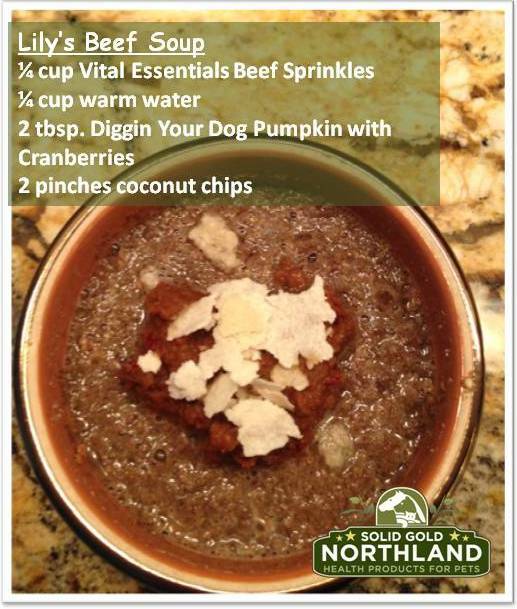 In a separate bowl mix Diggin Your Dog Firm UP Pumpkin & Cranberry with warm water to a paste consistency. Place Pumpkin mixture onto the soup. Sprinkle with coconut chips. Serve warm. One of the biggest challenges to home cooking for your pets is being sure you are preparing a complete and balanced diet. If your are making homemade meals periodically for your pet, there is no need to fret over this. However, if you are regularly making home cooked meals, it is vital to your pets health, that meals are nutritionally complete and balanced. Do you have a favorite easy recipe for your pet? I’d love to hear it. We are happy to offer our assistance, please contact us if you have any further questions.